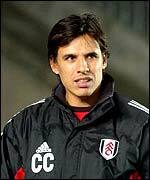 Fulham Manager Chris Coleman will not entertain talk among his players of Saturday's league clash against neighbours Chelsea until after Wednesday night's Carling Cup fourth-round trip to Championship strugglers Nottingham Forest. Coleman's side are on a high following Sunday's 4-1 away victory over Newcastle United, but the boss is fully aware that consistency has not always been their strong point. "We've had a trend where we've got a massive result like that and then fallen off it again and it's a tough game tomorrow," stressed Coleman. "We're not even talking about the weekend's game against Chelsea who have quality. We're talking about what will be a hard game. "Albeit Forest are at the wrong end of the league in the first division, it will still be a hard game for us. "Nottingham Forest will not be expected to beat us but it will be tough and we've got to keep the consistency going. "What we've not got to do is go there and have a poor result. "Then we are on the back foot for Chelsea on Saturday and you don't want to be on the back foot against a team like that. We do have to make sure we don't get carried away." The Fulham boss certainly has no intention of following the route of Arsene Wenger, Sir Alex Ferguson and Jose Mourinho by fielding anything less than his strongest available line-up at the City Ground - despite the clash against Barclays Premiership leaders Chelsea being so close on the horizon. "Arsenal and United, possibly Chelsea, maybe don't play their strongest teams, though their second teams are strong enough, but this is a chance to progress in this competition," said Coleman. The only absentee from the team which beat Newcastle on Sunday is expected to be striker Collins John, ruled out for two weeks with a thigh strain. That means that Fulham's former Forest goalkeeper Mark Crossley, hero of the win over Newcastle, will again keep Dutch international Edwin van der Sar out of the side. "While he plays like that, he is picking himself," said Coleman of Crossley. Fulham's young boss brought in some of his fringe players for the 4-1 second-round win at Boston, but now he insists that a place in Europe next season is too big a prize to take chances with. "We played a lesser team against Boston. No disrespect to them but it was early on in the season and we still delivered a team which was capable of getting the result, which we did," Coleman added. "In the last round against Birmingham we fielded our strongest team and I'll do so again." He needs only to look at last season's finalists, Middlesbrough and Bolton, to see what the Carling Cup can do for a club outside the big three. "It's a good opportunity for us to get into Europe through this competition. Look at Middlesbrough, they are playing in Europe now, they are at the right end of the league and are playing with a lot of confidence because they won the Carling Cup," he said. "You can attract players when you are successful. "Steve McClaren will the the first to admit that the reason he was able to sign the players he did was because of the success they had and that he was able to offer them European football. "It does make it easier when you come to talk to players. 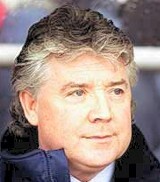 "Bolton got to the final and look at the way they have progressed this season. If we can manage to do well in this competition, particularly if we can get to the final, it does set you up." Nottingham Forest's new-look management team face their first test against Premiership opposition in the Carling Cup when Fulham arrive at the City Ground. Former Luton coach Mick Harford was installed as Joe Kinnear's assistant at the beginning of the week following the departure of stalwart coaches Ian Bowyer and Liam O'Kane - who had served the club for more than 30 years apiece. Harford, who was with Kinnear at Wimbledon and Luton, is hoping his arrival will precipitate a turnaround in league fortunes with Forest currently lying second bottom in the Championship table. But the Reds must first face top-flight Fulham, after beating Scunthorpe, Rotherham and Doncaster in the Carling Cup's earlier rounds. Harford said: "I'm really looking forward to the challenge which is in front of us here at Forest and it's nice to have been drawn at home to Fulham in my first game. "It's a test for the staff and the players but hopefully we can get a result and progress in the competition which means a higher profile for the club and hopefully an increased income. "It's a great tie for us to be playing and hopefully the fans will turn out for us and create a good atmosphere." But Harford knows he and Kinnear face a tough task improving the fortunes of a free-falling squad who have failed to produce a victory in their last five league outings. "It's a challenge I'm really looking forward to and one I am really excited about," Harford said. "I can't wait to get started. Joe had asked me once before to join him but at that time Luton were struggling, in trouble off the field, but now I think I'm entitled to say I've left the club in a strong position. "So I just felt the time was right to join Joe at what is still a massive club. "Joe's also been a friend of mine for a long time and also a colleague in the past so it's going to be easy working with him. "I've really enjoyed my first days working with the lads on the training ground. "We all know the club is in a difficult situation at the moment but we believe we can turn things around."